In this experiment you will look at combining the use of the accelerometer on the micro:bit to measure the orientation of the micro:bit and using it to control the angle of a servo. Ready to shake, rattle and roll? The accelerometer is a component that you won't find in the kit's bag of parts. Why? 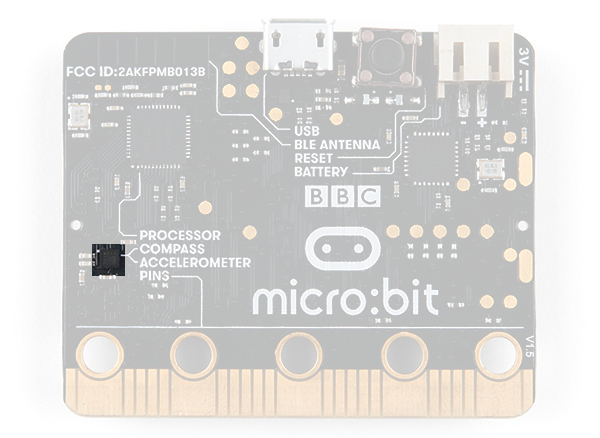 Because it is on the micro:bit itself! On the back of the micro:bit you can see a number of small chips. One of them is the accelerometer. 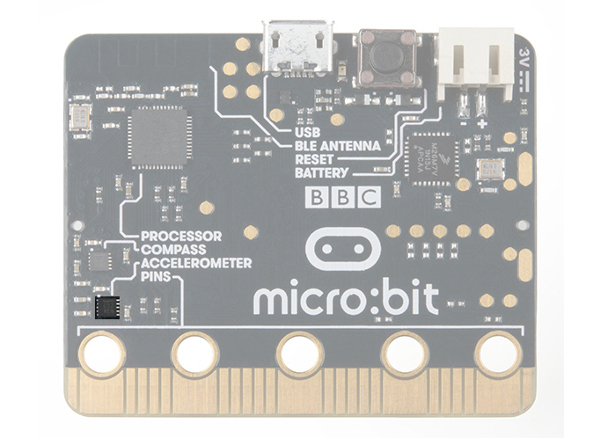 The micro:bit has an onboard accelerometer that measures gravitational force. Depending on the version that you have, the accelerometer and compass can be on separate ICs or combined into a single IC. 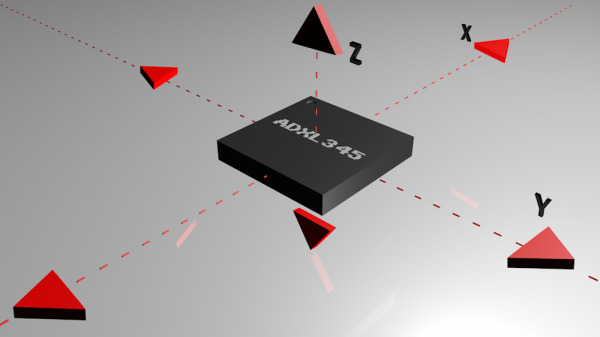 An accelerometer is a sensor that measures the gravitational forces pulling on it in all three dimensions of the chip's X, Y and Z axes. Not only can an accelerometer measure the raw forces pulling on the chip and the object that the chip is sitting on, but it can also detect steps, shakes and other motions that have a specific pattern. On top of that, you can use an accelerometer to simply detect the orientation of the device. Did you ever wonder how your phone knows when you turn it from portrait to landscape? It is all because of the accelerometer in your phone! Ignoring the servo class code again, we've got some new stuff! The accelerometer module comes with five built-in functions and recognizes 11 gestures. To see the full documentation, click here. The accelerometer.get_x() statement will return the acceleration measurement on the x-axis as a number between -1024 and 1024, depending on the direction. Since the value stored in num needs to translated to an angle between 0-180 from a range between -1024 and 1024 it needs to be scaled. Adding 90 to the scaled value sets a range of angles for the negative accelerometer values from 0-89, and positive accelerometer values from 90-180. 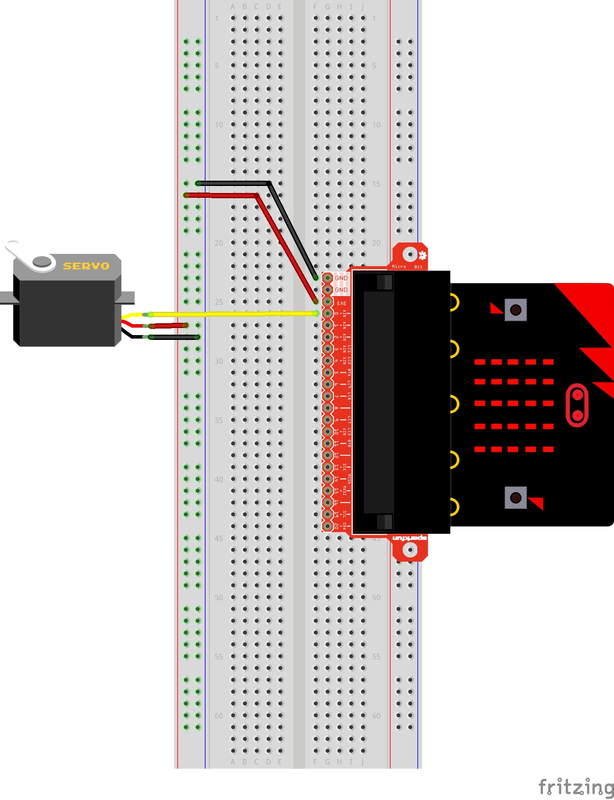 At the beginning of the program the servo should move to 0 degrees and then react to the orientation of the micro:bit. If you hold the micro:bit flat, the servo will be at 90 degrees. Then if you tilt the servo to the left, it will move less than 90 degrees toward the value of 0. If you move it to the right, the servo will move toward 180. You may be holding the micro:bit in a different orientation. Flip it around and try again! Double check your wiring! Remember, red to 3.3 volts, black to ground, and white to signal.